Bruce Bradley's Hearty Homemade Vegetable Soup is oh so delicious! You can make a big batch of soup over the weekend, serve it up for a couple meals, and freeze the rest for quick meals when you don’t have the time to cook. Soup is an amazing way to get your family eating vegetables without a lot of fuss! Soup is also a very economical meal. Serve it up solo or with a side salad or a wedge of cornbread, and you have a real meal that doesn’t break the bank! Last but not least, in these colder winter months, there’s no better way to warm up after a long day than a piping hot bowl of soup! Now a lot of folks have forgotten about vegetable soups. In our society we’re so caught up with protein, many people think vegetable soup is somehow incomplete. Well, I’m hear to tell you those folks are wrong. Maybe they’ve been left unsatisfied by some salty, highly processed canned soup substitute, but a REAL, homemade vegetable soup is both hearty and delicious. And while fresh vegetables are great if you have them, I think frozen veggies can work just as well! Use a high quality vegetable broth. I like to use my own, homemade broth, but please, avoid highly processed broths like Swanson. They’re really not much more than salted water with some highly processed additives. I think chopped leeks also add a lot more flavor than onions, so give them a try sometime. If you don’t like leeks, I think a good sweet onion like a Vidalia or Walla Walla can work well too. Of course, yellow onions will work fine … but I think sautéing them becomes even more important to draw out their sweeter flavor! For the potatoes choose a nice Yukon Gold or red potato since both should hold their shape well. Russets will break apart so try to avoid them. Make sure you adjust the vegetables to suit the tastes of your family. I think I’ve got a delicious blend of veggies here, but pick what works best for your family. Probably one of the easiest substitutions to make is to add some peas. Don’t forget the lemon juice. I’m telling you, when cooking it’s the mixture of fresh flavors that gets our mouth watering. So squeeze in some real lemon juice and add the flavor. It does amazing things to round out the taste of this soup! And thanks to a reader comment below, here’s an idea if you have a family member who doesn’t like diced tomatoes. Simply puree the tomatoes and blend them into the soup. You’ll get all of the flavor with none of the chunks. Thanks to Sandy for this great idea! So without further adieu, here it is. 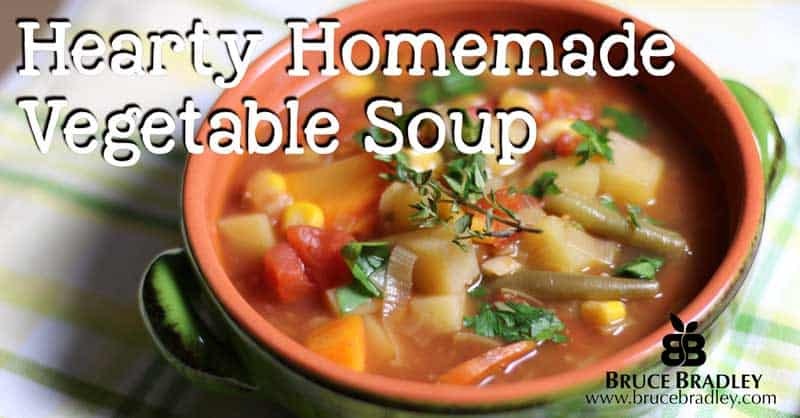 My favorite, Hearty Homemade Vegetable Soup. I hope your family enjoys it as much as mine does! In a 8-quart pot, warm olive oil over medium-low heat. Add leeks/onions, garlic, and a pinch of sea salt. Cook, stirring occasionally, until soft. Add carrots, potatoes, green beans. Continue to cook, stirring occasionally, until carrots start to get tender—about 5 minutes. Add the vegetable broth and increase the heat to medium high. Bring the pot to a simmer, then add the tomatoes, corn, and pepper. Reduce heat to low. Cover and cook for about 25 to 30 minutes or until all the vegetables are fork tender. Add the parsley, lemon juice, and remove from heat. Don't use the green part of the leeks. Cut the tops off and save for a batch of homemade vegetable broth. A great kitchen ladle is a must for any soup or chili recipe. I recently realized the ladle I had been using was old and plastic … which got me wondering what sort of plastic it was made of and then thinking there might be BPA in it. So I decided it was time to replace the old one with something that I didn’t have to worry about, like this stainless steel ladle from ChefLand. A great, non-slip cutting board is an invaluable kitchen asset when cutting up the vegetables for your soup. I upgraded to these Epicurean non-slip boards this summer, and I’ve been really pleased with them. I’ve been reading and enjoying your blog for some time now. Thank you for this recipe. I, too, love soups and find it to be a perfect way to feed my family tons of vegetables. I will definitely be trying this. One thing I may do differently that always helps my kids is to puree the tomatoes before I add them. My kids don’t like chunky tomatoes. Keep up the fantastic work you do here. Thanks so much for your comment, Sandy. When I was writing the post, I thought about the “tomato issue.” You see, I have a brother who dislikes tomato chunks. It’s a texture thing, and a pretty common one at that. I thought about saying you can just not use tomatoes if your kids don’t like the chunks, but I didn’t think of pureeing them. What a great idea! All the flavor, none of the chunks! I hope you don’t mind, but I’m going to add your suggestion into the post!